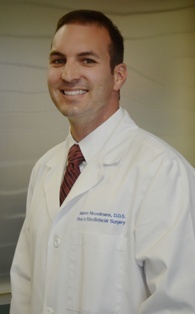 Board certified oral and maxillofacial surgeon Dr. Aaron Noordmans grew up in Kern County. He received his Bachelor of Science degree from the University of Michigan. Following his undergraduate studies he spent two years in a research lab authoring several articles in the field of neuroscience. He then went on to complete dental school at the University of Southern California earning his DDS in 2005. After dental school, he was indoctrinated as a dental officer in the Navy. While in the Navy, he completed a one year General Practice Residency at the Naval Hospital Camp Pendleton. His following two years were spent serving as the dentist and dental department head aboard the USS DUBUQUE LPD-8 where he earned his Surface Warfare Medical Department Officer award and a Navy Commendation Medal. Dr. Noordmans then decided to pursue the specialty of oral and maxillofacial surgery and he completed his residency at the University of Miami/Jackson Memorial Hospital in Florida and received the prestigious “Professor’s Cup” award under world renowned oral and maxillofacial surgeon, Dr. Robert E. Marx. His surgical interests are dental implants, wisdom tooth removal, bone grafting, orthognathic (corrective jaw) surgery, maxillofacial trauma, jaw reconstruction and oral pathology. He currently maintains surgical privileges at St. Agnes Medical Center. Dr. Noordmans is a member of the American Association of Oral and Maxillofacial Surgeons, American Dental Association, California Dental Association and Fresno Madera Dental Society. He is also a co-director of the Central Valley Dental Forum which is a branch of the Seattle Study Club. Dr. Noordmans and his wife, Kasey, have four young children. He enjoys spending time with family and friends and numerous outdoor activities.